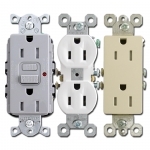 Update your home or business with new electrical outlets & GFCI receptacles for light switch covers in a range of colors & styles including GFCI, duplex, round, TR (tamper-resistant). What type of electrical outlet should you buy? What type do you need? Here are your options along with points to consider when choosing them. What are they even called? Outlet, receptacle, plug, socket, electrical device - so many terms! Shop for round receptacles with a single plug, duplex outets with two sockets, square Decora outlets for modern wall plate openings, or GFCI receptacles with a reset button in the middle. View all colors available in a single type so you can easily find the best color for matching your switch plates or wall paint finishes. 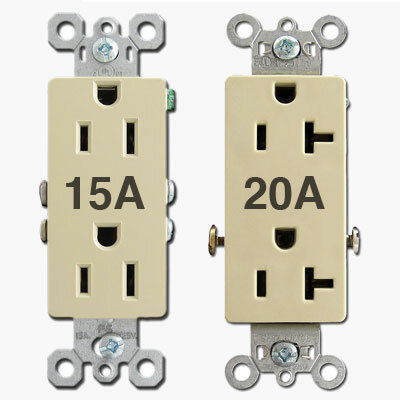 15 Amp vs. 20 Amp Standard outlets typically come in 15A and 20A versions. 15 amp devices just have two straight slots; 20 amp devices have one shorter straight slot and one sideways "T" shaped slot. Currently manufactured electrical outlets also have "D" shaped grounding leg openings, although much older devices will be missing this safety feature. "Amperage indicates the amount of current that can be safely drawn through the device, so select devices based on the amperage rating of appliances you plan to use in that location. Most homes have 15A devices installed, but if you'll be using many appliances at the same time at a particular outlet or otherwise drawing a lot of power, then the 20A units may be the better choice if your wiring can accommodate it." Regular Duplex Outlet This is the most common receptacle switch found in homes and accommodates two plugs. Typically the most affordable outlets, choose this style if you'd like to match your current sockets or if you are trying to keep within a tight budget. 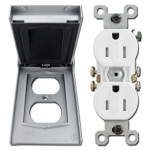 It fits into flattened rounded openings in standard duplex outlet plates. Available in 15A and 20A versions. 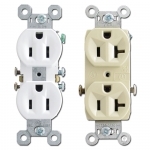 Buy duplex outlets in all colors. Single Outlet Also known as a simplex receptacle, these 1.375" diameter round outlets fit into covers with a 1.406" opening. 15A and 20A versions. Buy single outlet receptacles in all colors. 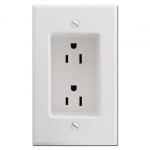 Block Outlet Receptacle These decorator outlet switches have a modern rectangular shape that fits into block (rocker) openings or Decora wall plates. 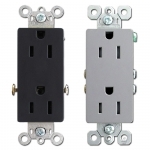 The advantage of these is that all block electrical devices (rocker, slide dimmer, GFCI) fit into the exact same opening - a large rectangular roughly 1.25" wide by 2.5" tall. This makes it easy to change devices at any point in the future without having to buy new switch plates. (The term "Decora" is a Leviton trademark.) 15A and 20A versions. 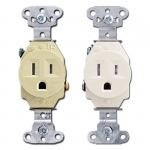 GFCI or GFI Outlets Designed with a special safety feature, these ground fault circuit interrupt (GFCI) receptacles detect current leakage and breaks the circuit if it exceeds a certain level. You'll recognize these switches because they have reset buttons in the middle. They are typically required in locations near water sources, so be sure to check your local codes for guidelines if you have any questions regarding when to use them. They fit into the same squared-off opening as block outlets. 15A and 20A versions. Buy GFCI receptacles in all colors. 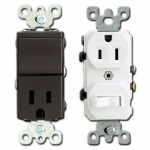 Tamper-Resistant Outlets A safety advancement, these devices have shutter-type covers blocking the interior of the plugs to help prevent objects being inserted into them. Also known as child safe GFCI receptacles or tamper proof sockets (although that cannot be guaranteed), these are a good choice where a safe, secure environment is a priority such as in homes with children or in residential care facilities. Available in Decora, duplex, and round versions in 15A and 20A versions per style. Buy tamper resistant outlet receptacles in all styles and colors. Combination Outlets The convenient switches allow you to add a light switch next to your socket without having to install a larger electrical wall box. You'll find duplex versions as well as decorator versions like the one shown here. View all combination outlet devices. Despard Outlets Smaller than a standard outlet these "Despard, or "interchangeable" electrical sockets are mounted individually on a strap. The fit into the end openings on fit into 29/32" W x 11/16" H plate openings oriented in either a horizontal (The switch plate will screw into the strap.) 15A and 20A versions. Weather-Resistent Outlets Designed to meet UL requirements for UV light exposure, cold impact, accelerated aging, and stringent material requirements to ensure corrosion resistance. Recessed Outlets The perfect solution when you have furniture pushed right up against a socket, these devices allow room for the plug before the cord bends down and out of the way. 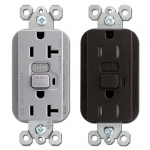 Floor Outlets - If you need to add a receptacle in the middle of a room and have access to it from a crawl space in the floor, then floor mounted outlets are a great solution to keep cord from being laid over walkways or in high traffic areas. Buy floor mounted electrical outlets. 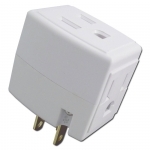 20A Power Outlets - These larger round outlets often feature a twist-lock feature that helps prevent power cords from being unplugged inadvertently such as those installed in ceilings or laid across walkways where someone tripping on a cord could pull it out. These fit specialized outlet receptacle plates with a 1.62" diameter openings to fit a this 1.56" round switch. There are also similar 30A devices that are slightly larger as well that fit into 1.73" diameter opening cover plates. 30/50A Range or Dryer Outlets - The heavy-duty power outlet receptacles are used for larger appliances such as dryers and electric ranges that draw larger amounts of current while in use. These outlets fit into a 2.125" opening outlet cover. 30A/50A/60A 3 & 4 Wire Receptacles - There is a whole range of larger power outlets for heavy duty industrial equipment. Each varies slightly in size, amperage, and screw hole placements. See round electrical outlet covers if you wish to get an idea of the number of choices.